Before starting, cut yourself 20 small pieces of striping tape. I made each piece about an inch long, but depending on the length of your nails this may need to be longer. 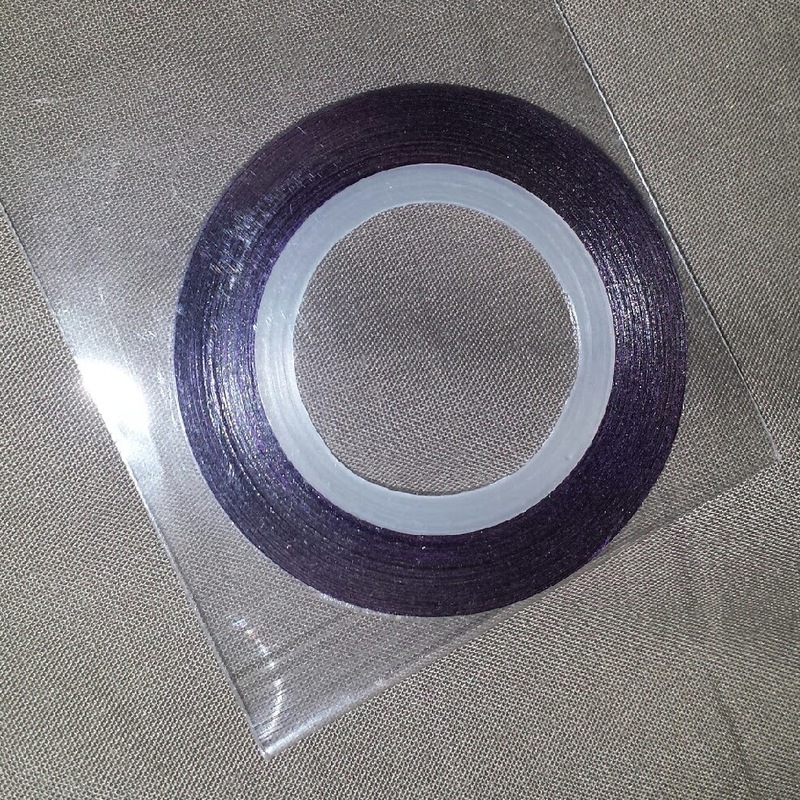 Stick the tape to the edge of the table or desk that you are using to rest your hands on whilst applying. You can buy a set of 10 rolls of striping tape for only 55p from Amazon. Begin by applying your base coat. 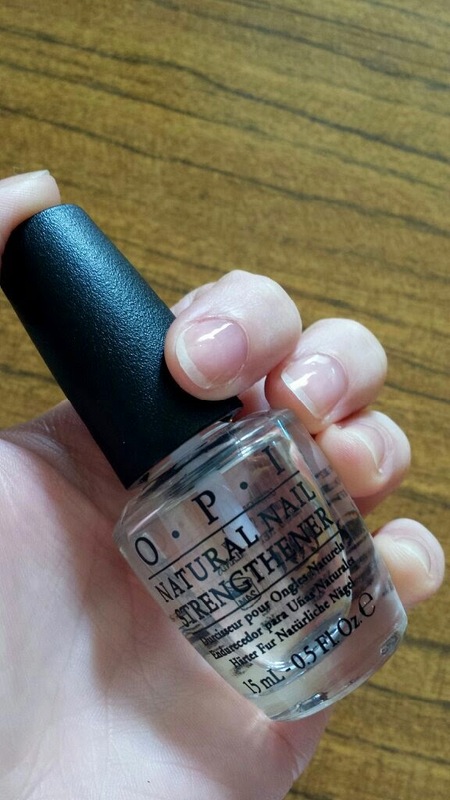 I used my OPI Natural Nail Strengthener as I have weak nails. I love using this as a base coat because it helps my nails to stay stronger, avoiding splits and breaks. Also, it dries super fast. You can buy OPI Natural Nail Strengthener for £7.95 from Nail Polish Direct. Once the base coat is dry, apply a coat of your red polish. It is a good idea to use a red that doesn’t apply sheer. If it is a sheer red, you will quite possibly need two coats, meaning that you will be adding time onto the process by waiting for the first coat to dry before applying a second. The first coat usually dries pretty fast, so if you choose a good opacity red then you should be able to move onto the next step fairly quickly. 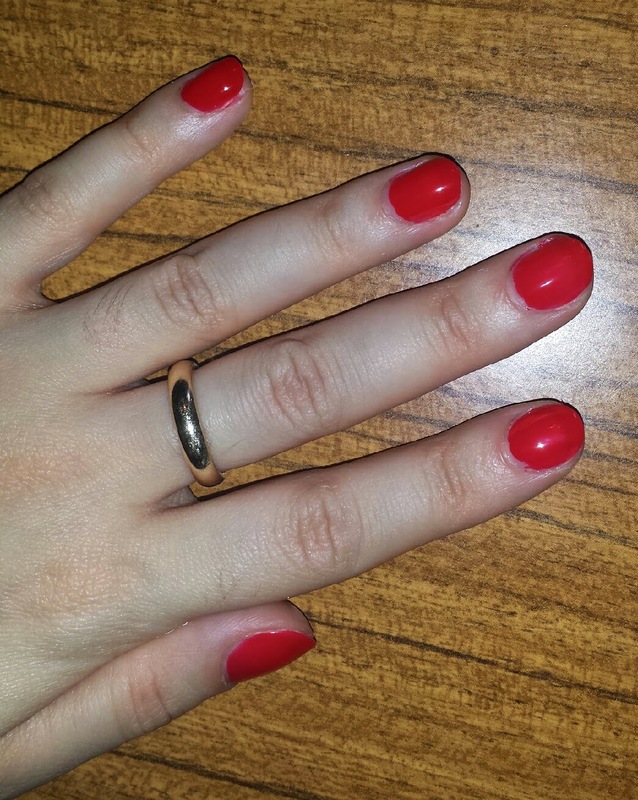 I used a W7 - Pillar Box Red. I bought mine for only £1.75 from Fragrance Direct! When your red is dry, take a piece of your striping tape. Apply it vertically down the centre of your nail on your little finger. 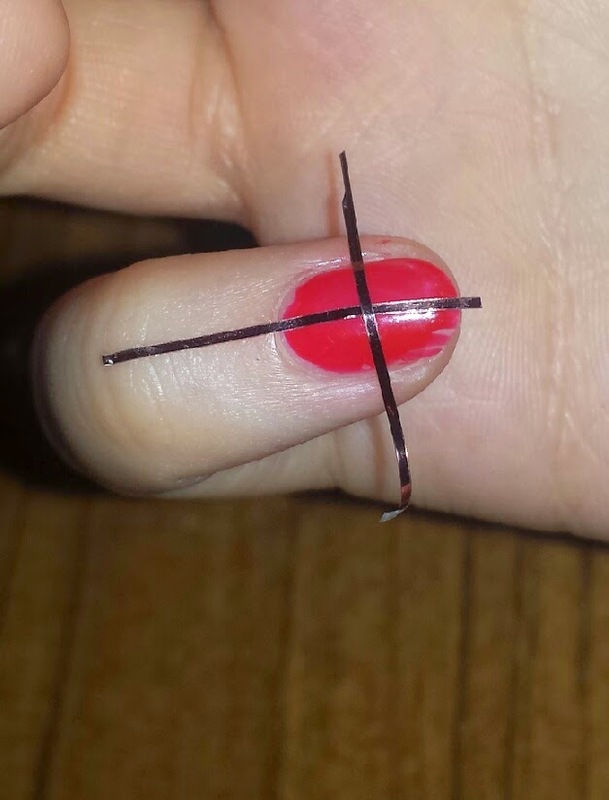 Take the second piece of tape and apply it horizontally across the same nail to form a cross. Continue to do this to every nail on one hand, whichever hand it is that you decide to paint first. You may find that using tweezers helps you to apply the tape more easily, but I am okay without them. It is a matter of preference! Once the striping tape is applied, make sure that it is pressed down well. If any of the tape is slightly lifted from the nail then the next layer of polish may leak under it, so definitely check before continuing to the next step! 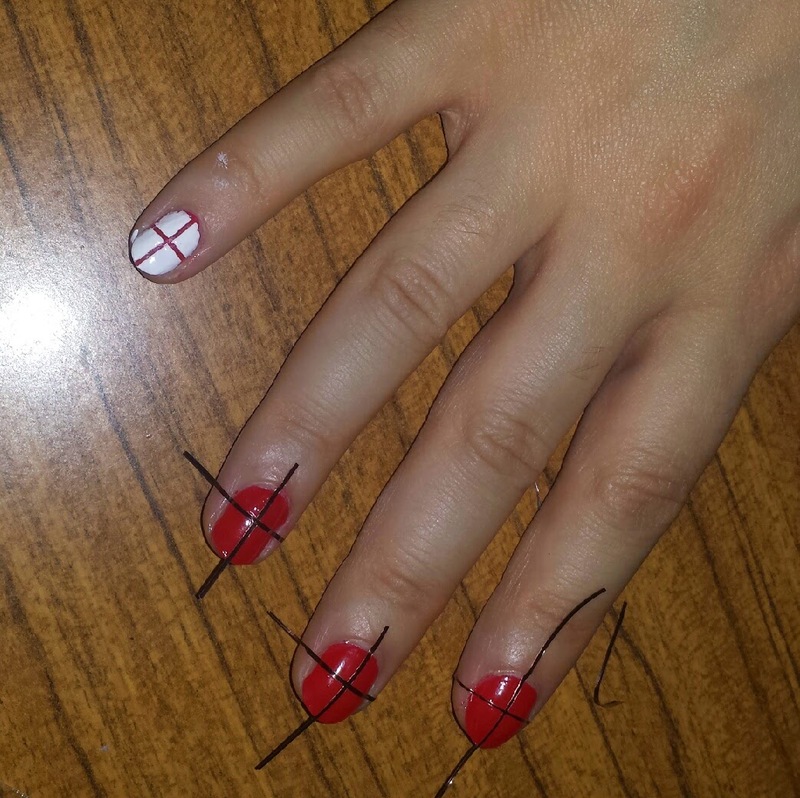 Take your white polish and begin applying it over the top of the striping tape and red polish. I like using Sinful Colors Snow Me White for this as it is a very thick white that will cover the red and be opaque in one coat. Whilst the polish is still wet, take off the tape in reverse order to which you applied it. If you followed what I said above, then begin by removing the horizontal piece and then the vertical piece. It is important to do this whilst the polish is still wet, so I do it straight after applying the top layer of polish. You can buy Sinful Colors Snow Me White for £1.99 from Boots. After doing this with the first nail, continue to do the same for each nail. Once you have finished every nail on the first hand, apply your top coat (I use my Seche Vite Dry Fast Top Coat) so it can dry faster and therefore make the next hand easier to complete. You can purchase Seche Vite Dry Fast Top Coat for £9 from Boots. Once you feel that you can apply your striping tape to the nails on your other hand without smudging your already completed nails, then begin the same process on the other hand. So there you have it! 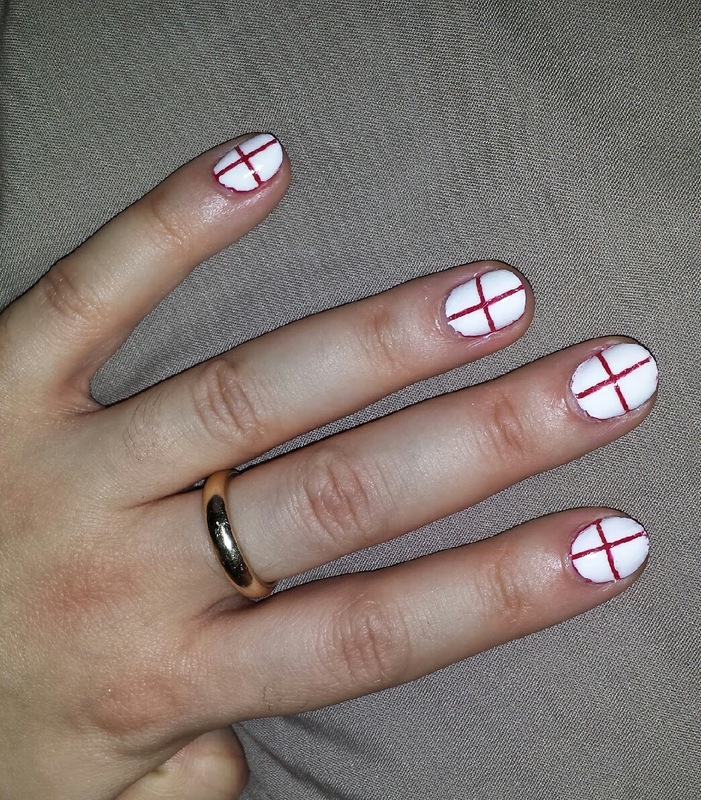 You should now have perfectly striped, England flag nails! All in time for the first England match of the World Cup! Who are you supporting in the World Cup? How will you be showing your support? I’m your newest follower on Bloglovin' :).. Hope you can follow back! omg! I love your nails... so cute. btw, I'm having a giveaway and would like to invite you to enter. Thank you very much! :D I am glad you like them!